- The Friars kick off the regular season against Atlantic Hockey foe AIC. Providence enters the game ranked fifth in the country, marking the fourth time in five seasons the Friars have begun the year in the top 10 of the national standings. They were tabbed to finish second in the regular season in the official Hockey East Preseason Coaches Poll. - Last year, Providence enjoyed its fifth-straight berth in the NCAA Tournament after finishing runner-up in the Hockey East Tournament. They won 24 games in 2017-18. - Providence brings in nine newcomers to the roster, including four NHL draft picks, including the 19th overall selection in 2018, Jay O’Brien (Hingham, Mass.). - Vermont opens 2018-19 with a singular road contest at #4 Michigan. The Catamounts were selected to finish 10th in the regular season by the Hockey East coaches, while Michigan was picked to claim second in the Big 10. - Kevin Sneddon’s squad adds six freshmen to its roster for the upcoming campaign, following the departure of Ross Colton, who signed with the Tampa Bay Lightning during the offseason. 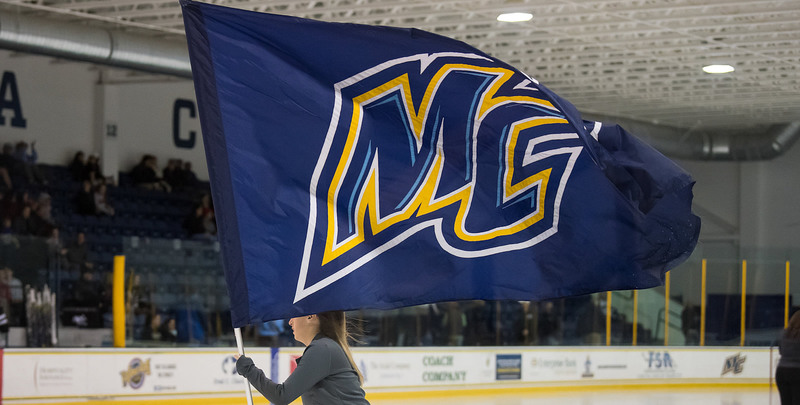 - Scott Borek debuts as the head coach of the Merrimack Warriors on Saturday, kicking off a two-game homestand against Lake Superior State. Borek was the bench boss of the Lakers from 1996-2001, compiling an overall record of 76-94-15. It marks his fourth stint with a Hockey East program, as the Dartmouth alumnus previously served as an assistant coach at Providence (1985-89), associate head coach at New Hampshire (2002-15), and associate head coach at Providence (2015-18). - The Warriors boast 10 fresh faces on the 2017-18 roster, joining 19 returners from 2017-18. Merrimack has advanced in the Hockey East Tournament three times in the last four years, adding youth to an experienced winning core. - Albie O’Connell begins his tenure behind the Terrier bench with an exhibition outing against Acadia on Saturday night. The 1999 BU grad is the only current Division I men’s head coach who has won a league regular-season title, a conference tournament championship, and reached the NCAA title game as both a player and a coach. - The 2018-19 Terriers add two NHL draft picks to their roster, including Joel Farabee (Cicero, N.Y./1st round, 14th overall/Philadelphia) and Jake Wise (Reading, Mass./3rd round, 69th overall/Chicago), following Brady Tkachuk’s departure to the Ottawa Senators. - Last year, Boston University captured the ninth Hockey East Tournament crown in program history, downing Providence, 2-0. The MVP of the 2018 Hockey East Tournament, then-sophomore Jake Oettinger (Lakeville, Minn.) made 30 saves in that title-winning game. - The Eagles were selected by the Hockey East coaches to win their fourth-straight and 17th overall regular season crown. - Jerry York graduated just one player in 2018, while his 2018-19 outfit includes 21 players that accounted for all but four goals a season ago. Oliver Wahlstrom (Quincy, Mass. ), the 11th overall pick in the 2018 NHL Draft, is one of five rookies joining the Boston College this season. - UMass returns top scorer in sophomore John Leonard (Amherst, Mass./13-15-28) as well as a pair of defensemen named to the 2018 Pro Ambitions All-Rookie Team in Cale Makar (Calgary, Alta.) and Mario Ferraro (King City, Ont.). - Newcomers to the Minutemen include Anthony Del Gaizo (Basking Ridge, N.J.), who led the USHL in scoring (40-32-72) in 2017-18 and was named the league’s Player of the Year. - UMass Lowell opens 2018-19 with an exhibition contest against Acadia before starting the regular season Oct. 12-13 against RIT at home. - Last season marked the first time since 2013 that the River Hawks did not appear in the Hockey East Tournament title game. They were bounced from the playoffs in the first round in 2018 and have been selected seventh in the Hockey East Coaches Preseason Poll. - Maine starts its 2018-19 campaign picked to finish fifth in the Hockey East standings and receiving votes in the USCHO.com national poll. In the 2018 playoffs, Maine won its first playoff series since 2014 and was ranked in the national polls, reaching No. 20 in January. - Seven games from Alfond Arena will be shown on local television this season on WVII/WFVX (Bangor), WPME (Portland), WVII Presque Isle and FOX College Sports. The first broadcast comes on Nov. 3, when the Black Bears host league foe UMass in Orono.